Ai-Ai De las Alas jokes that maybe another Best Actress trophy for 'Ang Tanging Ina Mo, Last Na 'To' is needed to silence her detractors. 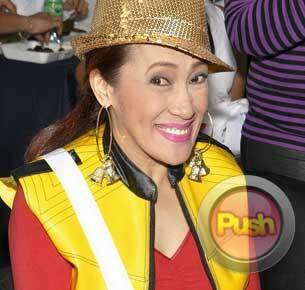 Ai-Ai De las Alas is overjoyed that her movie Ang Tanging Ina Mo, Last Na 'lsquo;To continues to attract viewers across the country. Ai-Ai once again thanked God for this unexpected big blessing. "Napaka-thankful ko sa Diyos kasi hanggang ngayon pinipilahan pa rin ang Tanging Ina. Dati nagmamakaawa ako na panoorin nila, at idine-dedicate ko 'lsquo;yung pelikula sa lahat ng ina sa buong Pilipinas. Salamat sa lahat ng nanonood." Though the movie franchise is supposedly on its final installment, there are rumors that another sequel is being planned. Ai-Ai would rather leave the decision to the producers, but if it were up to her, she no longer wants a part four. "Hindi naman sa akin ang Star Cinema. Kapag sinabi ng mga boss na magkakaroon ng part four, go lang ako. Pero kung ako ang masusunod, ayoko na ng part four. Gusto ko matatapos ang Tanging Ina na nasa taas siya, para grand exit." The pressure now for the Comedy Concert Queen is to come up with a movie that will equal if not surpass the success of the Tanging Ina franchise. But Ai-Ai thinks that rather than aiming to break her own record, what'rsquo;s more important is to make sure she continues to make movies that viewers will enjoy. "Iba kasi ang Tanging Ina. Kung hindi man maabot ng iba kong movies 'lsquo;yung success ng Tanging Ina, sisiguraduhin pa rin namin na magiging maganda lahat ng gagawin namin at mage-enjoy ang mga viewers." Ai-Ai'rsquo;s win as Best Actress in the recent Metro Manila Film Festival sparked controversy coming from those who are dissatisfied with her victory. When asked if she is wishing for another Best Actress win for Ang Tanging Ina Mo, Last Na 'lsquo;To, which might eventually lead to a grand slam, the comedienne said that this is might be the only way to end all intrigues. "Siyempre para 'lsquo;yung mga detractors ko e wala nang masabi, ha ha ha! Kapag nanalo pa ako ng isang award, mare-realize nila, 'lsquo;Alam niyo na, day! 'rsquo; Kapag naka-Grand Slam ako, 'lsquo;yun na talaga ang patunay na magaling ako." Ai-Ai jokingly called out to other award-giving bodies to watch Ang Tanging Ina Mo, Last Na 'lsquo;To so they can see that she is truly deserving of recognition. "Kagaya ng pag-claim ko noon na mananalo ako ng Best Actress dahil magaling naman talaga ako sa Tanging Ina. Ngayon naman ike-claim ko uli na makaka Grand Slam ako, ha ha ha! Mananawagan din ako sa ibang award-giving bodies na deserving ako."